Summertime greetings from all of us at Tiwala Kids & Communities! 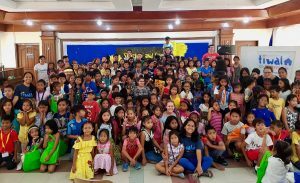 The first half of April was spent teaching Vacation Bible School (VBS) classes in 7 villages in Legazpi City. Thanks to our visitors from Mission Go Global in Chino Hills California, we were able to share with 220 children about Jesus as the light of the world (the VBS theme this year). The kids enjoyed learning new songs, listening to Bible stories, playing games, making crafts, and discovering Biblical truths about how Jesus shines in and through our lives. We capped the VBS with a big program, distributing gifts to children and giving them opportunities to showcase their learnings from the VBS. After the VBS, Tiwala celebrated the academic achievements of its 18 scholars. Eight of them successfully graduated from elementary school and many of them received school awards and recognition in their classes. In order to reward their hard work, as well as to beat the summer heat, the scholars and staff had a refreshing dip at a nearby resort. It was the first time for several of them to go and swim in a pool. Aside from playing water games and enjoying food, we also took the time to thank the Lord for how He faithfully guided, protected, and provided for the scholars throughout the school year. Our small group meetings with Tiwala mothers continued throughout the summer months as well. Through the years we have seen these moms grow in their commitment to the Lord and to their families. In order to give them a respite from their chores and other responsibilities, Tiwala held a Mothers Retreat on May 19. It was a day of fun, food, fellowship, and feeding from God’s Word. The mothers were also blessed to receive encouragement, not just from the staff members of Tiwala, but also from its supporters. Thanks to all of you who contributed and donated gifts so that the moms would feel appreciated and special. Towards the end of May, Tiwala Kids & Communities joined ten other NGO’s in leading a regional children’s camp. The rights of children, specifically their need for protection and right in participation, were discussed during the camp. Simultaneous workshops on song writing and visual arts were also conducted in order to hone their skills and help them see how they could advocate their rights using different forms of expression. Summer is now almost over, and school is about to start on June 4. In order to prepare for the new academic year, the staff of Tiwala took the time to reflect, evaluate, and plan how we can best serve our beneficiaries and maximize the resources that the Lord is giving us. We are looking forward to the many opportunities before us to continue to build strong foundations in the lives of the children and families here in Bicol, Philippines. Thank you very much for your prayers, support, and encouragement. These are truly what help us keep moving forward, not only during the summer, but in all the seasons of our ministry. God bless you!